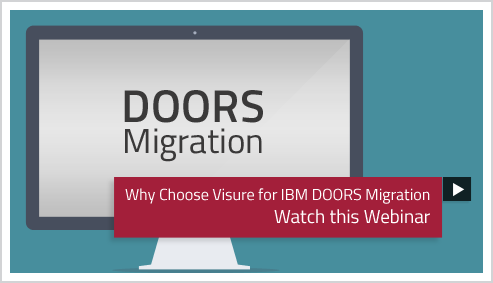 Visure Solutions provides the easiest and most complete migration from IBM DOORS in the market, so you can start building better products, quicker and more efficiently than ever before with Visure Requirements. Migrate complete DOORS projects from the aged and expensive platform to Visure Requirements in a safe and easy way. 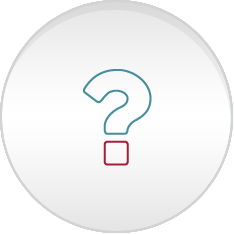 Three easy steps: Select your project, export the whole project with a single click, and import it into Visure Requirements. 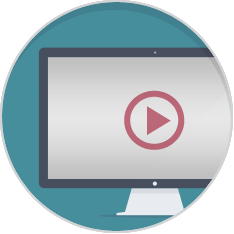 Finetune your Visure Requirements project to take advantage of extended views capabilities in Visure Requirements and othe available functionality. This automated migration will move all your data including links, baselines, baseline sets, attributes, types, users, groups in one step. The migration process not only exports the requirements data from IBM DOORS, but also exports the entire data schema, including all of the relationships and attributes. It also goes one step further by exporting the assigned users, so that you can start working with Visure Requirements straight away. 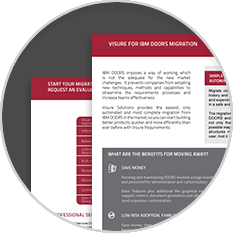 Visure Requirements maintenance costs 50% of DOORS; half of what DOORS customers pay today. start the migration now! do it yourself!